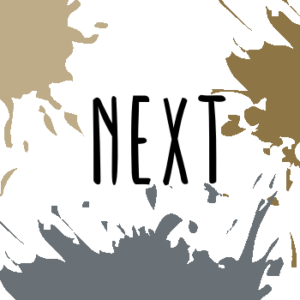 For the Colour Combo blog hop we are given three colours to use for our project. This month we have been given the colours: Crumb Cake, Soft Suede and Basic Gray. These three colours can be found in our Neutrals Colour Family. Whether you have joined me hopping over from Tricia’s blog hop or are just starting the Blog Hop with me, I am sure you will see some fabulous projects using these colours. 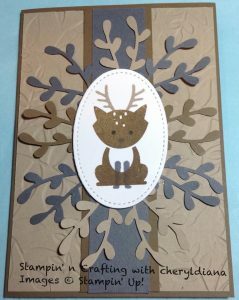 For this month’s Blog Hop I decided to use Foxy Friends stamp set and the three colours swayed me towards stamping a Reindeer. The main body and head were stamped in Crumb Cake ink, the antlers were stamped in Soft Suede and the legs, eyes and nose were stamped in Basic Gray onto Whisper White card stock. This was then die cut using one of the Ovals from the Stitched Shapes Framelits. For the base card I used Crumb Cake card stock and embossed a Soft Suede cardstock mat using the Layered Leaves embossing folder. This was fixed to the base card with the raised indentations facing the card base. I then cut a strip of Crumb Cake and a narrower strip of Basic Gray card stock and glued them onto the card front. To make an attractive border around the reindeer I punched out sprigs in Crumb Cake, Soft Suede and Basic Gray card stock using the Sprig Punch. These were glued around the Reindeer. To finish off the card the Reindeer was fixed to the card using Stampin Dimensionals. I do hope you have enjoyed my card. Please do leave comments as you hop through each blog. Please click on the next button to visit Angélique. What a nice idea! I have to pull out that stamp set again!